The Velomacchi Duffel impresses on sight with the choice of material - tres hipster-retro - and quality of the build. The 50-litre duffel actually has a 42-litre main compartment with three pockets on the outside. A document pocket of sorts with a lanyard for keys, and two flap-over pockets on each side. As duffels go, this is a nice one. It's got a stitched and taped waterproof liner for the main compartment, waterproof zippers with a small storm flap, compression straps with no loose ends and metal G-hook based mounting straps. The duffel also hides a pair of full-featured shoulder straps that hide in the base so that you can use it as a backpack if you need to. However, in use, there are a few issues. First, the mounting straps work well when the mounting points are far from the bag, but when they're close up, you run out of adjustment and the bag can only be cinched down so far. There are also intrinsic issues with the bag moving around slightly, that is common to all luggage that uses bottom mounts. 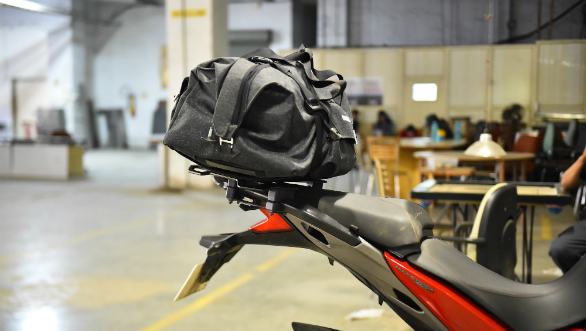 When the straps go to the top of the bag, it pulls the entire bag forcefully to the seat/rack making it more secure. Second, our test unit has a small glitch. The waterproof liner and the duffel are shaped sort of like a boat with a pointed bow and a rectangular stern. But when this bag was made, the liner was installed the wrong way around. So we were unable to really pull the bag up at the stern end. We assume this is a problem with just our bag because otherwise, the bag works well enough to fill up as well as to dig stuff out of. The shoulder straps work well too and they seem to take up almost no room when stowed which is always nice. 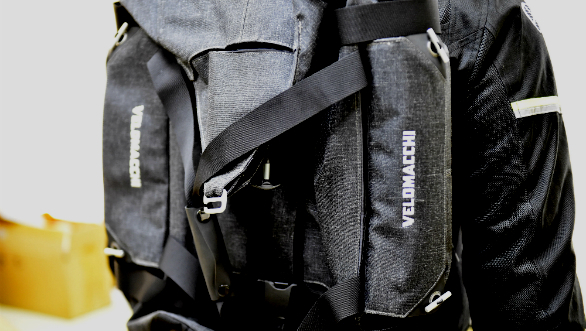 The Velomacchi website also claims that this duffel is hydration compatible but we couldn't figure out how, unless they mean adding a bladder to the pocket where the shoulder straps go - we cannot see this backpack system being used in anything except an emergency and in that sense, the hydration ability is superfluous, especially given that there is no provided way to route a drink tube. And that brings us to the price. At USD 279, this is an expensive duffel. It certainly shows the quality in material, stitching to justify its price. But I'm finding it hard to recommend this wholeheartedly because of two primary reasons. First, the mounting system is an interpretation of a popular system but the bag will always move around slightly which annoys me. And second, because this is a motorcycle-grade luggage, this is a fairly heavy duffel when empty which makes me reluctant to use it for other travel - say on a flight - where I'd prefer a cross-body sling strap over backpack straps. 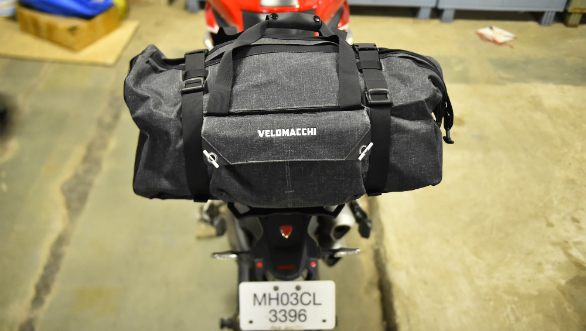 That said, if you're looking for an overbuilt, stylish duffel that can pull double duty, Velomacchi makes a good one.